Different structural design details by location of building project. Also review of the different structural design types required to obtain permits in different jurisdictions. Interviewer: Hey everybody. 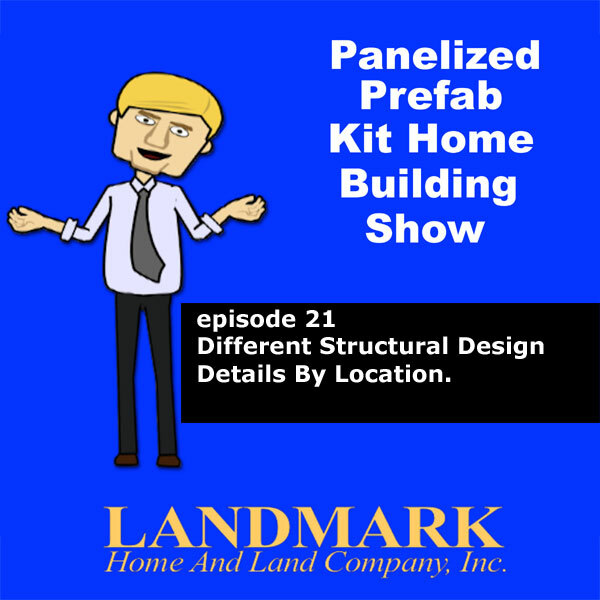 Welcome back to the Panelized Prefab Kit Home Building Show. With me, as always, is the President and Founder of Landmark Home and Land Company, a company which has been helping people build their new homes where they want exactly as they want across the nation and worldwide since 1993 and that gentleman is Steve Tuma. How’s it going today buddy? Steve Landmark: It’s an excellent day. Steve Landmark: Good day, a lot of customers calling with interesting projects in different parts of the country with different building department requirements. It’s interesting. Interviewer: Well, that’s good because I’ve got more interesting questions for you, so hope you’re ready to feel the feels. Steve Landmark: I probably have some interesting answers. Interviewer: Let’s hope. I want to talk today a little bit about plans again, about getting your plans engineered. And I’d like to go over a couple things again that we’ve touched about a little bit in the past. One of those is structural engineering. Can you just give us your basic expertise on what exactly structural engineering is? Steve Landmark: In a simplified version, it’s just to make sure that the structural design of your home can withstand the happenings on your site. So let’s just say your building in Colorado, there’s a lot of snow in areas. Some part of Colorado is more desert but a lot of it is snow. So you can end up with big snow accumulation overnight, because of the mountains you can also end up with high winds. Also, the way that mountains are, you can end up with expansive soils. So then if you took that same house and said “Hey, let’s build that I California.” You’re going to be in an earthquake situation. If you said, “Hey, now I want to move to Key West, Florida.” Suddenly, you’re in a hurricane situation. So the structural engineering develops the structure, the thing that holds the house up to be able to withstand those conditions. And sometimes those conditions like I say are earthquake or wind or snow loads or expansive soils. And that’s what we’re looking at. So basically, to simplify it, it’s just to make sure the structure is strong enough to withstand the conditions that it’s going to be built within. Interviewer: And we’ve talked a lot about working with building departments in specific areas, wherever a customer happens to be building a house, he’s going to have to deal with the building department in that area. And the request that they come up with, do they request different structural information a lot? Steve Landmark: Yes, it can vary considerably because building departments are different, it’s a national code. But the enforcement of that code is different in different areas. My opinion is basically because some areas, the building departments are more sophisticated and others, they are a little less sophisticated. So that means that some areas like I mentioned before were – they don’t even ask for building permits. Other places, they want simplified structural engineering like header and beam calculations just to make sure that the beams are holding up your house or the headers that are spanning your window and door openings are strong enough to support it. That’s more on the basic side. Others will go through and want just foundation design because of the ground conditions. That happens a lot in Colorado and Texas and a few other places. And then other places want the full design. That’s the foundation and the complete wood structure, shear walls, different connections, beam sizes and different situations to make sure that the house is strong enough. So it can be a pretty detailed process. The key point to it is that whatever your building department wants, we’re fully capable of engineering the plans to those – to their requirements and make sure that the plans are complete and accurate for that. Steve Landmark: So it can be a little interesting because some building departments don’t communicate as well so they’ll just say they’ll get me engineering. And I was like, “Well, is there a specific detail that you’re looking for?” but that’s where we come in. And we’ll help out, we’ll communicate them and find out what it is that they need. So it can be a little intricate, but we’re fully set up to get that taken care of. Oh, and one other detail are truss designs. All truss designs should be stamped by an engineer licensed in the state. And we all supply the truss designs to make sure that they are set for the proper loadings for the design of the home. Interviewer: And with that include like let’s say calculations for things like headers and beams that must go along with structural information. Steve Landmark: Yeah, that’s more of a basic one. Some, like certain parts of Pennsylvania and New York, will just had to ask for the header and beam calculations. You know and then some will ask for foundation only, some will ask for the full structural design, so it’s really building department by building department. So where that can get confusing is in some of these areas. They’ll say no, you don’t need engineer stamped plans if you’re building a simple design. But let’s just say suddenly, you turn in plans for a chalet design with 19-foot walls, tall ceilings, big glass, big windows, that falls outside of certain parameters that they have that they can just remi– that they can just review quickly. So that could be why it gets a little bit confusing but either way, we’re here to help. But California, you need engineering everywhere except for parts of Humboldt County. Parts of Texas, you’re going to need foundation design. As you get to the Coast, you’re going to need full structural design. Parts of Arizona, Colorado, New Mexico, you’re going to need partial or full engineering. The East Coast all along the wherever hurricane or high wind hits, you’re going to need structural design. And what’s interesting about this is the interpretation. We did a house on Block Island off of Rhode Island, way up north, they needed hurricane engineering because so many of these storms are now ending up that far up. And we’ve even been in situations where, in Tennessee, they need a certain level of engineering. New York, Pennsylvania, some of those other states around there, they made – they may need very simple engineering or need more in-depth engineering. In the Plains States, it can vary significantly by building departments and also where they’re located and the sophistication of the building department. But again, it’s not something to worry about. Just let us know about your project, we’ll search it out. We may need a little bit of your help if it’s a smaller building department because they may not have a website. They may just have a form and they want to have coffee with you and talk about it. But you know, we’ve been able to help everyone get through the process and we do have engineers licensed in every state and some foreign countries. So we’re able to go through and get the plans put together. And if the building department throws a curveball, we’re pretty good at taking care of those as well. So, so far, we’ve been able to take care of every single one and every customer has gotten permits. Interviewer: It gets a little confusing and I can imagine overwhelming for some potential builders. Like this structural information that may be required, will that include a lot of times a foundation design? Steve Landmark: Yes. Yeah, the foundation is very important. It actually is what holds your house up. Interviewer: Mm-hmm. Yeah, it’s kind of important. Steve Landmark: So… Yeah, so the found– and that’s generally in an area if they’ll ask for only foundation design and not the above wood portion of the house, it’s probably because they’ve got expansive soils that under different conditions, the soil will heave and lift the foundation. So areas that are in mountain areas, they may request that and then parts of Texas, there’s a lot of expansive soil. So, but it can vary area by area. But yeah, foundation design is – it’s a very important part of it. Now, in some of these areas where they don’t ask for engineer stamped plans and that we will develop a typical set of plans in an assumed ground condition. And they can review your mater– your foundation contractor and we can make an adjustments. Interviewer: You hit about something a little bit earlier, truss design. Is that something else that may – a building department might come back with one specific truss design information? Steve Landmark: Yeah, truss design in itself is very specific you know. So if you’ve got – you know, let’s just say the 26 by 40 house. They want to know that it carries the right loads, the live loads, the dead loads and different you know snow loads, ground snow loads situations. So those are all details that we would go through and get put together. And it’s very important and a lot of building departments say, “Hey, you know we’ll approve the trusses after you install them.” We kind of say, “Well’ that’s kind of backwards. You know let’s get it all designed and get it approved up front.” And then deliver them and get them installed. So truss design is very important as is the complete design of the home. But most building departments want to review those up front. Interviewer: How do – how am I going to know if my building department requires the engineer stamped plans? That seems a little vague sometimes. Steve Landmark: It can be tricky. Where it gets tricky is in parts of Arizona, New Mexico, and Colorado, and then some of the Plains States, Montanas and the Dakotas. Generally, all of California will request it, all of Florida will request it. And then up the West Coast and up the East Coast, they’ll need it. But a lot of building departments, like I say, they don’t always communicate it well. They don’t say “Yes, you need engineer stamped plans to get permits.” They’ll say, “You need to meet this code.” Well, the situation is the code may or may not dictate, it’s more of their interpretation of the code of what you think. Our belief is if you’re in an area with high wind speeds, earthquakes, big snow loads, expansive soils, you should definitely do it. Now, I’ve just provided an answer there but I don’t want to create confusion for people because how do you know what a high wind speed is? You know you go outside in a 40 mile an hour wind if you’re standing there, that seems high. Generally, 90 miles or 100 miles, say 100 miles an hour over is generally they would do it. But the building department will generally tell you they’ll need it. There are certain conditions where they might say you don’t need it and then after they see the design of the home. Those are – now that falls back in our experience where we, when the building department says, “Hey, we don’t need engineer stamped plans.” There might be details of the house where we realized they’re going to come back and ask. Steve Landmark: And those details might be big walls, big, big expansive walls that are tall with a lot of glass in them or designs that are beyond a typical design. So something typical would be a simple design or home that’s fairly common. But if you took a home with a bunch of 15 and 20-foot walls with a lot of glass in them, that might be different. A home that’s got three levels exposed, they may ask for that. Different roof designs, they may ask for it. The reason being is it gets a little more complex and some building departments aren’t – don’t have the resources to verify that and they pass it onto the structural engineer. Now, we’re fully capable of taking care of those things, we do it every single day. So it’s not a big deal. It’s more of the situation of finding out what the building department wants. And they’re getting better at communicating, either you call them, we can check a building’s – the building department website, we can call them and have a discussion with them and we’ve got an understanding of what they need in general. But sometimes, we just need to see their particular perspective and what they think is important to put on plans. I would say 70 or 80 percent of plans are all the same. An engineered plan, it’s the 20 or 30 percent that’s kind of you know detailed by their particular experiences. And sometimes, what one inspector wants is different than another one even if they’re in the same building department. So we’ve got to you know sort through that. But what we do is we’ve got a method of making sure that the plans are complete, turn them in. and they if they come back with a checklist of items, they’re usually pretty specific saying, “Hey, we need verification of these three or four items or 10 or 15, whatever it may be and then we can go through and respond to them. And typically, a customer would obtain the permit. Steve Landmark: So it can be a little tricky in places like Colorado, parts of Arizona and New Mexico and the Plains States, parts of Illinois, even in Northern Michigan, Northern Minnesota, and then up in the Northeast, the building departments may have different requirements for different types of designs or different building conditions. But like I mention, we can take care of them. So a customer shouldn’t consider that to be like a big bad situation. It’s just something we can jump in, help them along and make sure that the plans are done properly. Interviewer: Mm-hmm. Well, you know building inspectors, to the average person, somebody says, “Oh, you have to see the building inspector,” or I guess an engineer would be about the same. Like the man behind the curtain, you just never know. When you walk in, you drop off your plans. How involved does an engineer get? Do they do actual calculations and structural design details or do they just simply stamp your plans and send you on your way? Steve Landmark: Well, there’s a couple of things there. Way back, there were engineers that would just look at any piece of plans, stamp it, move on. But I think as building departments get more sophisticated and knowledgeable and as the insurance companies of these professionally licensed engineers get involved, they want to know that the people are actually doing the work. Steve Landmark: Other engineers do different things. We actually go through and do the actual structural design based on calculations. So if there is a certain specified beam, there’s a calculation showing how much that beam can carry and make sure that it’s good for the design. And then there’s also design details showing the connections basically showing the foundation, the connection of the foundation to the floor, the floor to the wall, the wall to the roof and shear wall locations and different stuff. So we actually go through and do a full set of plans. The idea that someone’s out there and just by you know magic and they understand, they can just say hey, I know this is fine and stamp the set of plans, you know what? It may work but we’d rather have the documentation to show that we know it works you know. So if a building department has a question or anyone else has a question down the road or it can be documented that “Hey, this is what’s going on.” Now, you mentioned something about the intimidation of talking to building department or engineer. We’re fully set up for that. We can work with you to get you the set of plans so you can go on with the complete plans set, turn it in, and get the permit. And also the engineers, I work the engineers and all the design people to do it. So I can filter it so that any communication we have with the customer is at a level that they understand. And if they’re very technical, that’s great. If they have a lesser understanding, we can go through and take care of that. But you do if you’re in this place where you need full structural engineering, you do want it to be done right. Interviewer: Mm-hmm. Can you – do you mind going over some of the other types of engineering that may be required that we haven’t touched upon today? Steve Landmark: Yeah. Generally, other building, some building departments will ask for plumbing, electrical, and HVAC. HVAC being heating, ventilation and air conditioning. Steve Landmark: It’s not extremely common but it is happening more and more where building departments want electrical load calculations. To show that if you have a house of 200 amps or 400 amps, that’s exactly what you need. They want riser diagrams, how it gets – how the power into the house and how it gets distributed. We were running into more requests for plumbing. Plumbing being water but also gas piping to know that the pipe sizes are right. And then also the HVAC, the heating and air conditioning systems to make sure that the heat loss calculation is done right, to make sure that the sizing of the heating and air conditioning units are properly done. But also verification to make sure that the duct worked and the returns are right. Steve Landmark: And sometimes this comes out of situations where you know the equipment is getting a little more technical or the installers keeping up with the knowledge. But it also can be very helpful to people when they’re out there getting bids. Because when you have a certified, let’s just say a found– not a found – a heating and ventilating and air conditioning design, you know that everyone is bidding the same system and one guy isn’t getting a lower price and you know keeping a doctor to out of your room. And then you find out that hey, maybe the room is not as comfortable as it should be. We’ve all been in houses where there’s a room where there’s a cold spot. Steve Landmark: Or a room that’s cool for whatever reason. Well, it’s quite possible when that house was built, someone saved a thousand dollars. Steve Landmark: And now they’ve got a cold room you know that may not be the best thing to do. So those are basically the main engineering, the structural engineering for the foundation and the house, the plumbing, the electric, and the heating and ventilation. Now there’s other details you can get into civil engineering. And that gets involved with grading plans and drainage plans. So let’s just say that you’re building on a mountain and you’ve got some rolling hills and your, you know or maybe some steeper parts of it. A civil engineer would go in there and figure out the best way to put your house on the land to make sure you’ve got a legally accessible driveway. To make sure that where you want your patio or whatever it fits and to make sure that the ground conditions are right for a properly installed foundation. And then that civil engineer may also help with a drainage plan to make sure that you know when it rains, the water comes off your house and driveway or any other nonporous areas and the water gets distributed properly so you don’t flood a neighbor out or flood your own driveway or whatever it may be and make sure that the drainage follows the planned drainage for the county. So those are basically the main types of engineers that we get into. Sometimes in certain areas, you’ll need a geotechnical engineer so that you can go through and they could take a boring of the ground to find, to do a geotechnical test, which is basically the strength of the soils. And then there’s also the possibility of a geologist to find out what’s under your house. Steve Landmark: Are you on a fault line you know type of situation or what kind of rock is there. Those are you know, the geologist is pretty rare, the geotechnical engineer in those areas where you need full foundation engineering is pretty common. But I guess we rattle the bunch of people off. I’m telling you, the people that you might need to have, we can help you with a lot of those. You shouldn’t get overburdened with it, it just have an understanding that it might need to happen in certain places. Where you might need more of those is in like Colorado and California, and Florida. Other places, you know the Midwest, some of the Plains States in Northeast, some of the Northwest, you don’t have to get that deep. So we’re talking about engineering here, so it applies to you, we’re capable of helping you and we have the knowledge to go through and make sure that you’re set up properly to have an understanding of what’s going on with your project. So it’s easier for you to budget it and build it. Interviewer: Well, OK. That’s going to do it for this episode of the Panelized Prefab Kit Home Building Show. But before we head out, Steve, tell our listeners once again how best to get hold of you guys over at Landmark Home Land Company. Steve Landmark: The best way is to give us a call at 800-830-9788 where we answer the phone. If for some reason you do get a voicemail, we will call you back right away. We like to talk to our customers to find out what we can do to help them and we’re responsive. And then you can also check our website out. The company is Landmark Home Land Company and the website is just the initials L as in Landmark, H as in Home, L as in Land, C as in Company dot com lhlc.com. And you can always email Mike. He works with people up front at mike@lhlc.com or you can contact me Steve@landmark@lhlc.com. And then we’re also on Twitter, Facebook, Instagram, YouTube. So you could find us there to check some videos out and pictures, and cool information. Interviewer: Awesome! And there you have it. So for Steve Tuma and myself, thanks for joining us again and we will see you next time. Steve Landmark: Have a great day!